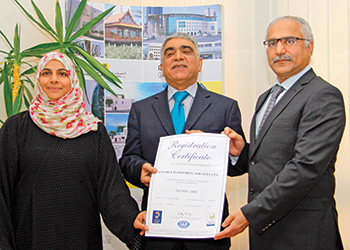 FROM LEFT: Faiza Hassan, operations supervisor AJA Europe, Dr Akbar Jaffari, chief executive, Jafcon, and Al Ansari. The certificate was presented at AES’s Diplomatic Area head office by Bahrain-based Jafcon consultancy and AJA, a provider of third-party management systems certification. AES prides itself on its ability to provide an integrated range of construction management solutions to its customers, spanning the full project life-cycle from conception through design and following work stages, to final completion of site works, handover and certification. With the government laying more emphasis upon private-public partnerships (PPP) in the housing sector, AES has been at the forefront to bridge the gap between the demand and supply of social and affordable housing, said Mike Stanley, the business development manager. It is currently acting as the design and supervising consultant on a PPP project being undertaken by Sharaka Development Company, which is building more than 2,800 homes for the Ministry of Housing (MoH). This project is being undertaken across two locations – Northern Town and Al Luwzi. Phased completion of the project starts this month (March). With regard to the social housing project at Luwzi, AES is on track to achieve Leed (Leadership in Energy and Environmental Design) for Neighbourhood Development (ND) certification.In June 2015, AES was awarded supervision for a housing project and associated infrastructure directly by the MoH on Island 14 West in Northern Town. “That project is for 577 social housing villas and associated infrastructure, and the targeted completion for those two components is 14 months and 22 months respectively,” said Stanley. Another significant project by the company is the five-star hotel development for Marriott at Bahrain Bay where AES is the architect and engineer of record, and working with an international group of French consultants including Group 6 and Setec. “We recently completed the concept stage and are aiming for the detailed design to be concluded by mid-2016,” added Stanley. Other projects under way include Gulf Hotel’s residential building in Juffair and an office building for the Electricity and Water Authority. Outside Bahrain, it carried out the detailed design of a 10.6 mgpd (million gallons per day) desalination plant located in Sur, Oman, which is being developed as a turnkey project by Sidem, a global desalination leader headquartered in France. Stanley explained that Sidem has utilised the engineering services of AES on a number of projects throughout the Gulf and is a repeat client of significant importance. In the marine sector, meanwhile, the company is also participating in a prestigious development being undertaken at Darari, southern Bahrain, for Manara Developments.